E-Hobby have also updated their preorder page for the Japanese Generations TG-29 Sandstorm with official images. 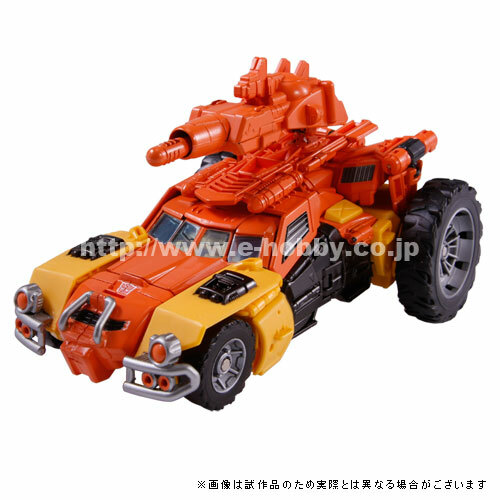 The Japanese Sandstorm is notably a lot more orange, with the gun, cab and wings all done in orange plastic as opposed to the yellow or black they were in the US release. Other paint deco changes include some silver on the front bull-bars. Once again we have attached the images to this post for your perusal. 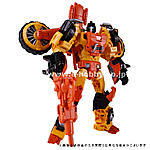 There's a lot I like about this color scheme and a lot I like about Hasbro's. Overall, I find Hasbro's stronger, but I think Takara could have made a few more changes to the deco that would have made me instantly prefer it. Had they kept the pelvis black, colored in the rear wheels/VTOL rotors orange, and made the yellow portion of the lower leg black, I think this would have been an instant win in the color department. These last 3 are the promotional images that were released earlier, just bigger and clearer. It's a shame his yellow didn't end up more orange like the original photos. I like the Hasbro one better. Not digging the surplus orange in place of some yellow and black. While the vehicle modes do look slightly better with a solid orange stripe down the middle, the VTOL just looks odd with the yellow fan rims next to nothing but orange, and dune buggy mode just looks extremely bland with almost nothing to break up the orange except some small yellow and black patches. 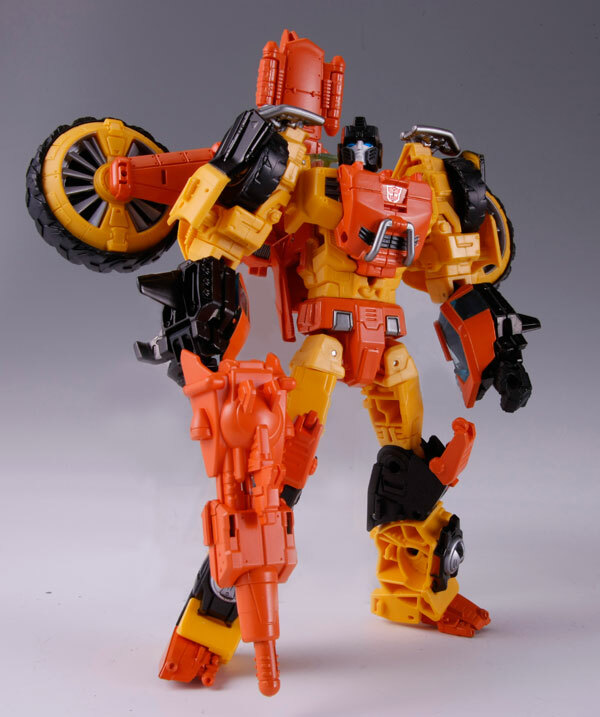 The robot mode also looks worse, with the orange forearms not meshing with the yellow shoulders and the orange feet drawing attention away from the upper part of the robot. 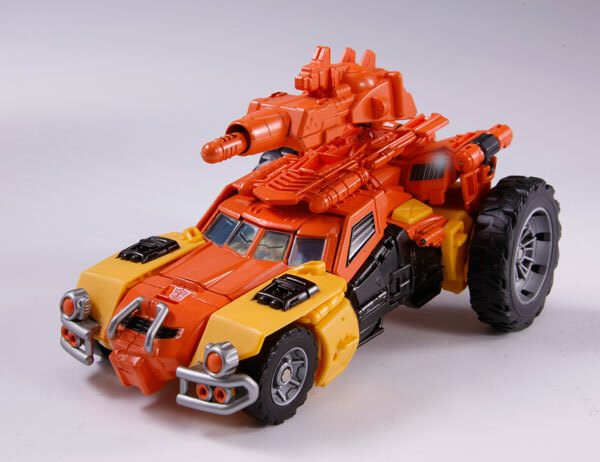 The gun also manages to look stupider as just one giant block of orange plastic, at least the Hasbro version has two colors on the gun. 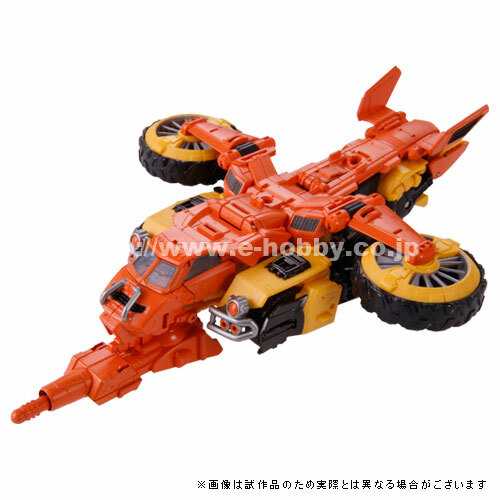 Really, the only improvement I can see here is the Autobrand being centered so it isn't just partially covered by the cockpit windshield in VTOL mode, and even then I like the Hasbro's Autobrand being off-center since it's not the usual placement. Like always, I'll stick with Hasbro on this one. I will have to say here lately Takara Tomy Transformers repaints are sucking!…badly!!! I remember when they did an awesome job with Tranformers Universe 2.0 and so on, but man Sandstorm, Blitzwing and Springer looks aweful!! And this is not Sandstorm, this is Chester Cheeta from Cheetos!! It ain't easy bein cheesy!!! I like the silver bumper stuff. But way too orange. Needs some black or yellow to break it up. However, I will wait for the in-hand pictures as most of time they are completely different story. 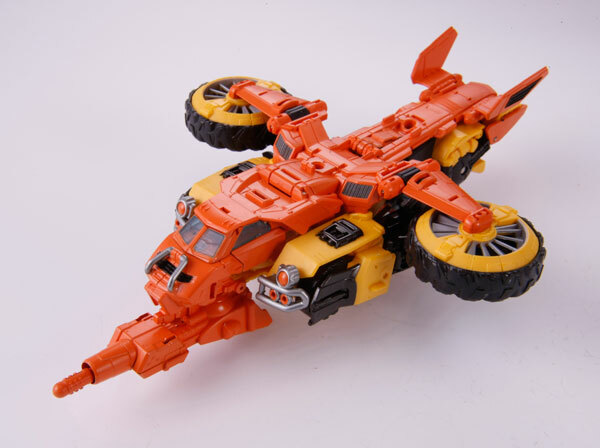 Like this better, but still can't get past the VTOL and how it looks in bot and car mode. Keep trying to figure out if there's a paint-free way to add Springer's blades and wheels to him, but I don't think it's possible. I still prefer Hasbro deco than TakTomy. I like this one better. The colours make it pop out more. Hasbro's Springer and Takara's Sandstorm is the winning team for me. All times are GMT -4. The time now is 8:52 AM.